Construction improvements and remodeling are extremely important for both residential properties and commercial structures. 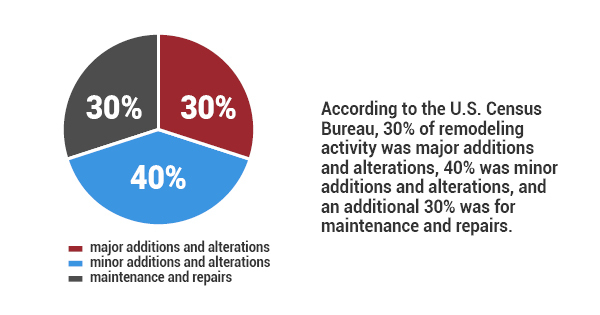 According to the U.S. Census Bureau, 30% of remodeling activity was major additions and alterations, 40% was minor additions and alterations, and an additional 30% was for maintenance and repairs. No matter what type of construction or remodeling project you're working on, you should always be using the correct equipment. In addition to hardhats, gloves, and all the tools necessary for completing a successful remodeling job, you should ensure that you're using a protective floor covering, as well. Floor protection during construction and remodeling jobs might not come to mind right away, but it's extremely important for a variety of reasons. Whether you're completely renovating a room or just panting a few walls, protective floor covering can over temporary floor protection throughout the entire process. Ram Board is a leading brand in protective flooring and is exclusively designed and manufactured with innovative, patented technology that ensures complete floor protection, no matter what type of floor involved or what kind of construction project is underway. Easy to use -- Floor covering materials are extremely efficient. These products can make an otherwise difficult construction or remodeling job much more practical and management as they are very durable and remain in place throughout the project. Cost effective -- Floor covering solutions are affordable and can be fully customized depending on the size and other project-related factors. Rather than spending a significant amount of lesser quality products, or refraining from using floor protection altogether, which will end up costing you more in the long run due to floor damages, utilize Ram Board throughout products your construction project. Quick installation and reusability -- All you need to do to install a floor covering is to simply lay out the material. You can do this in a matter of minutes, providing you with great protection from spill and scratches. Additionally, you can reuse the floor covering multiple times. If you want to learn more about protective floor covering during residential or commercial remodeling and construction projects, give Ram Board a call today.